Case studies, simulations, and how their companies and processes run. 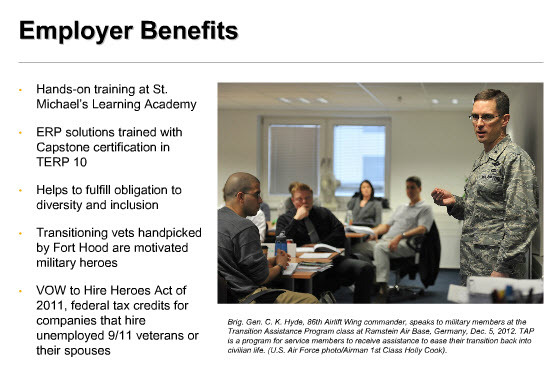 Military allows employers to receive tax benefits as well. On the call, Mike Allen, spoke about his experienced. He retired after 22 years of military service, and got into course, graduated in May. He was chemical radiological specialist; didn’t have software skills but liked SAP course and graduated from TERP10. Christine had instructors for them. 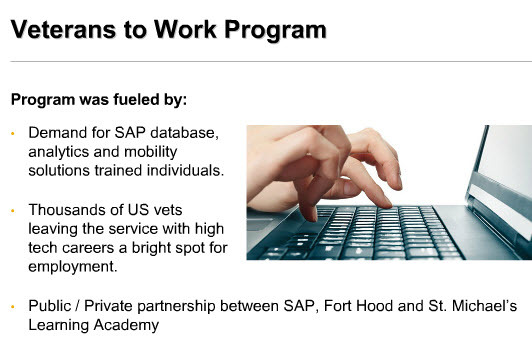 Keys to success to Mike – he didn’t know how to write a resume, leverage Linked In, and as part of the program; he felt the program taught him to be a civilian. Christine helped set up mock interviews. Employers would interview and help them get better at interviewing. Everyone in the class received job offers. 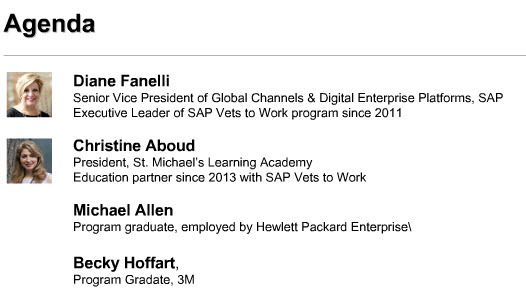 Mike works for HPE. He learned how to use social media to leverage opportunities. Mike sells software solutions to the federal DoD account. He helps “solve problems through software”. Mike discussed his fear of not knowing “what’s next” after leaving the military – it is filled with classroom. Becky Hoffart, started in military for 12 years as a medic and was also in logistics officers. She has her masters in logistics. She separated from the military, and saw bulletin board for SAP and St. Michaels. Started class in August 2016, graduated in November, and received MM certification. Becky now works at 3M. She says she needed to learn civilian lingo “PoC” is not point of contact but proof of concept. She is configuring plants, extending plants, using Jira. 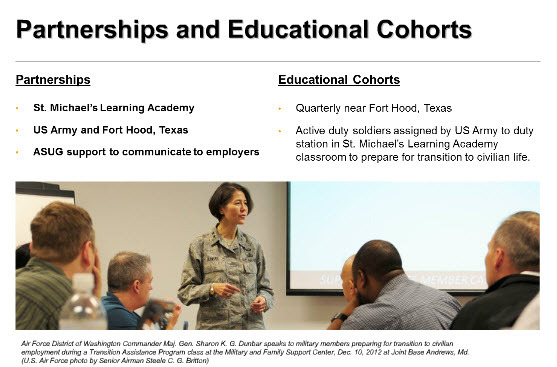 Q: Is program just open to Army? 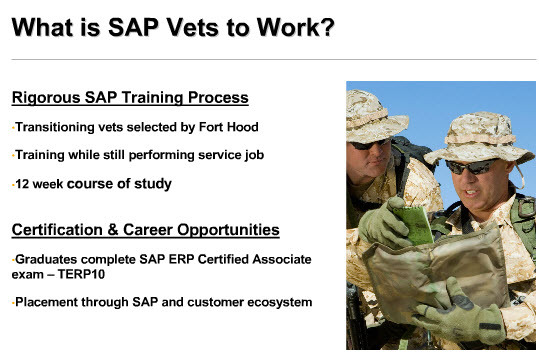 Q: Is geared for active-duty soldiers/marines, etc, and not necessarily admin military folks?